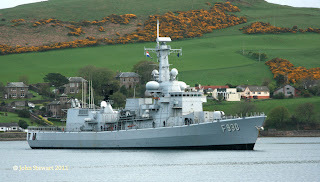 BNS (Belgian Naval Ship) frigate Leopold (F930) at Campbeltown 16 April 2011. Formerly HNLMS Karel Dorman (weird thing is that she appears to be flying the Dutch ensign?). Post provided by "our man in Campbeltown" ClydeNavalGazing correspondent John Stewart.